Four years ago, Bob McCulloch abused his discretion as a prosecutor and protected Mike’s murderer by refusing to press any charges against Officer Darren Wilson. McCulloch completely ignored standard protocol for a Prosecuting Attorney by enlisting the help of a grand jury to determine the charges against Wilson. It was a setup from the beginning. McCulloch abdicated his role as a County Prosecutor by making a politically calculated move that would shield him from criticism from the police and the media. It was outrageous, a miscarriage of justice and a complete betrayal of the primary charge for a prosecuting attorney. McCulloch overwhelmed the jury with redundant and misleading information in an effort to manipulate the jury's confidence in Wilson's guilt. A lawsuit was filed by one of the grand jurors detailing challenges and exposing their experiences on the grand jury. McCulloch admitted to allowing witnesses he knew were NOT telling the truth to testify before the grand jury. McCulloch thought he could avoid public scrutiny and accountability at the conclusion of this case. He was wrong. On Tuesday, August 7, the people of Ferguson and St. Louis County just made their power known by electing criminal justice reform advocate Wesley Bell for St. Louis County Prosecuting Attorney. 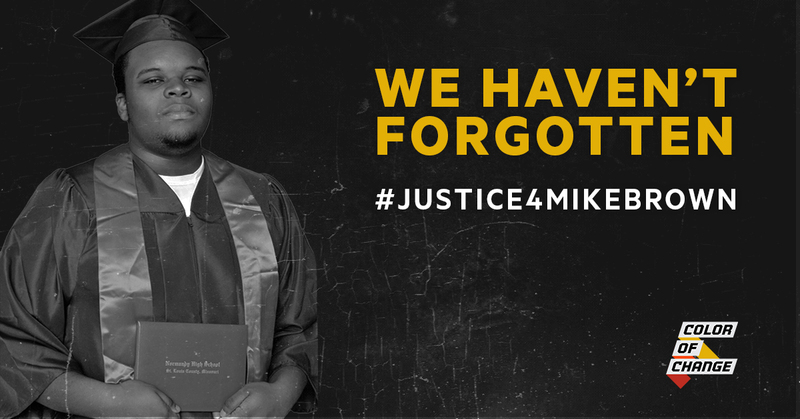 Newly elected Missouri Governor, Mike Parson cannot ignore the voters of St. Louis who have sent a very clear mandate - secure justice for Mike Brown now. Missouri Governor Mike Parson: appoint a special prosecutor to re-open the investigation into the fatal shooting, Michael Brown. The integrity of our County and the safety of our community depends on it.